This Creamy Ham and Potato Soup comes together in about thirty minutes making it the ideal wholesome weeknight meal. 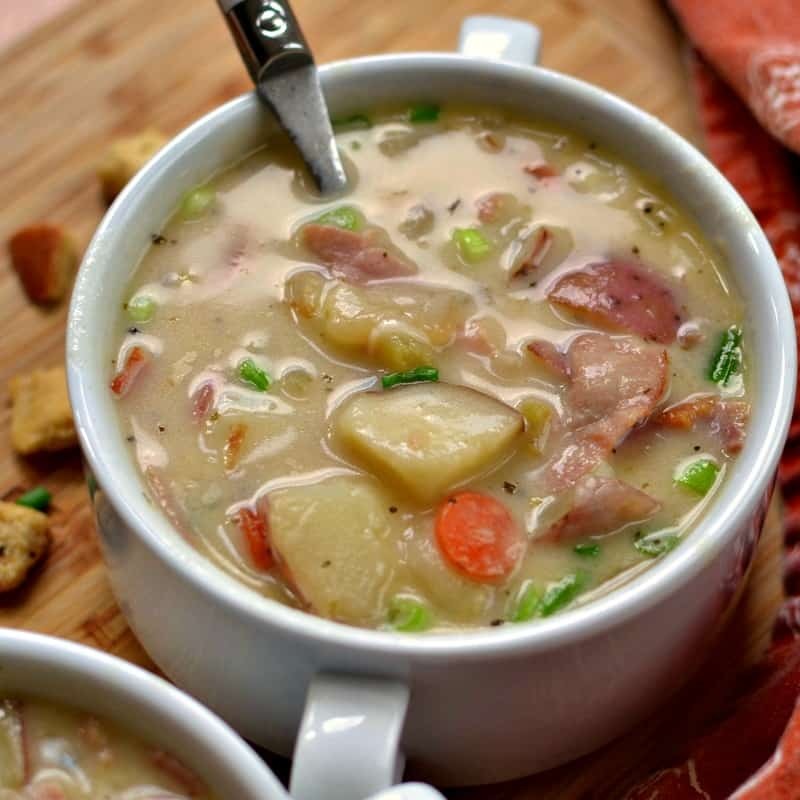 It is chock full of ham, potatoes, onions, carrots and celery in a creamy lightly seasoned broth. Anytime of the year is perfect for a good warm bowl of soup. Whether it is 110 degrees or 10 degrees soup is always welcome in our house. We love it! 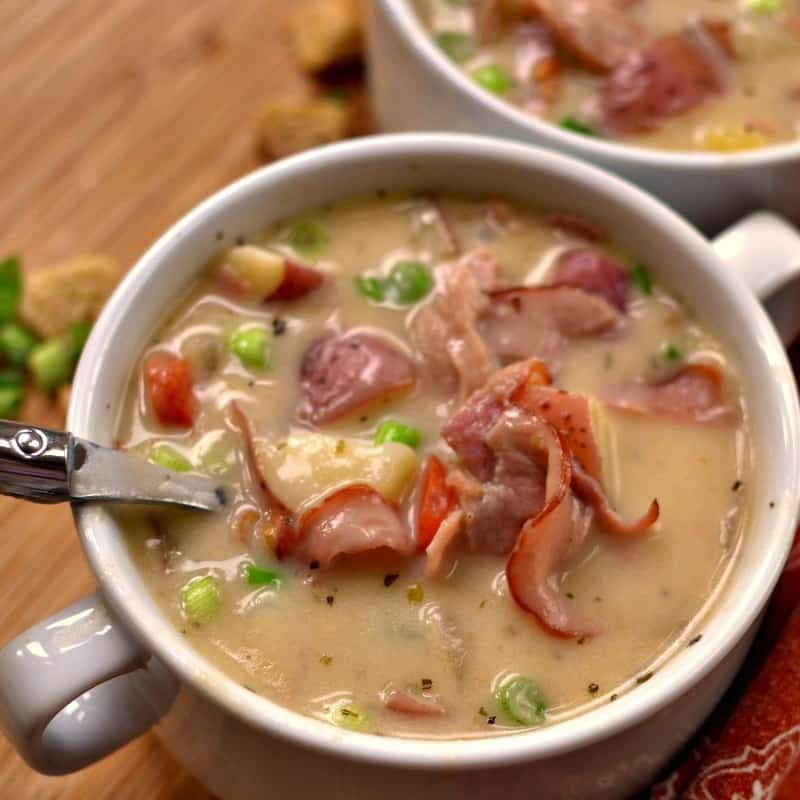 This Creamy Potato Ham Soup is a delectable combination of sweet ham and creamy potato goodness!! This superb soup recipe takes no time at all to make. Your family will be filled with healthy good for you creamy wholesome soup. This beautiful bowl of soups starts with skillet sauteed onions, celery, carrots, potatoes and ham and takes it to new heights of delicious goodness. Butter, flour and milk are added to create a creamy broth that makes this soup the perfect comfort food. Have I told you that I LOVE this recipe! What ham is best for Ham and Potato Soup? I personally like good quality sweet smoked deli ham that I can crisp the edges on. However any sweet smoked ham that can be diced into small bites works well. Leftover Christmas ham and Easter ham are perfect. You can also use a smoked ham steak. They are vacuum sealed and sold in the refrigerated meat section of your local grocery store. 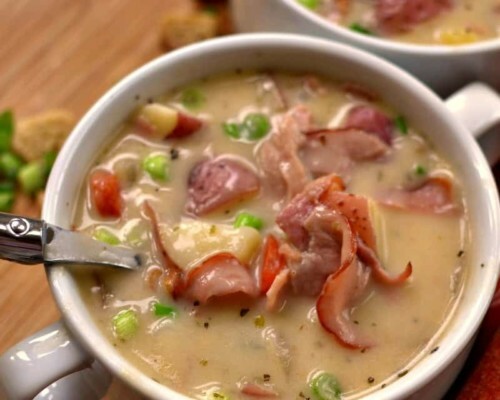 How do you make Creamy Ham and Potato Soup? First heat olive oil over medium heat in heavy stockpot or dutch oven. Add the onion, celery, carrots, potatoes and ham. Be patient and cook until the onions and ham start to crisp on the edges. Reduce the heat to low. Stir in the garlic, onion powder and parsley. Cook for just under one minute. Garlic cooks fast so don’t cook it too long or it will become burnt and bitter. In skillet over low heat melt butter and whisk in flour. Whisk over low heat for 3-4 minutes. Slowly whisk in milk working to make it creamy and to get out any lumps. When thoroughly mixed and thickened slowly stir into soup. Simmer for at least five minutes or until thoroughly warmed. Salt and pepper to taste. 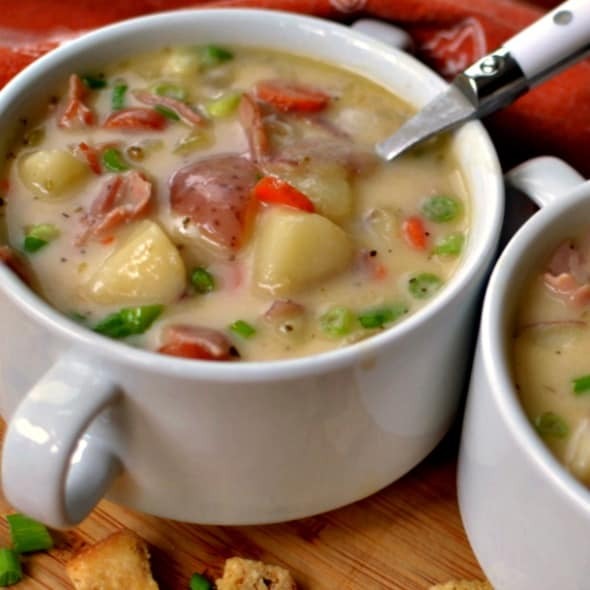 What potatoes are best for Ham and Potato Soup Recipe? Red Potatoes and Yukon Gold Potatoes hold their shape best in soup. I have also used white potatoes and fingerling potatoes. Do not use Russet Potatoes as they will breakdown and make a mushy mess. So if you are expecting twelve inches of snow or if fall is just beginning to show its lovely face or maybe its 95 degrees and there is no way you are turning on the stove than this delectable creamy soup is just what you need. Put the ingredients on your shopping list today and make your family a wholesome treat today. This post was originally published August 22, 2016 and was republished February 6, 2019 with new content. In large stockpot heat oil over medium heat. Add onion, celery, carrot, red potatoes and deli ham. Cook until the onions and ham start to crisp on the edges; approximately 5-7 minutes. Add the garlic, onion powder and parsley; cook for 1 minute. Stir in the low sodium chicken broth. Simmer until the potatoes are tender; approximately 15 minutes. In skillet melt butter and whisk in flour. Whisk over low heat for 3-4 minutes. Slowly whisk in milk working to make it creamy and to get out any lumps. When thoroughly mixed and thickened slowly whisk or stir into soup. Simmer until warmed. Salt and pepper to taste. This is a chunky soup. If you like it a little thinner than add more chicken broth. You can use any kind of good quality smoked ham cut into small bite size pieces or cubes. Can you throw everything in your Crock-Pot? I don’t have a stove. There’s always room for a good bowl of soup on the table. I love the creaminess in this soup and how hearty it is to fill the hungriest family member. I think I’ll warm up with this tonight! Thanks so much Linda! I hope you enjoy it! Can I substitute corn starch for the flour to make this gluten-free? Sorry about the delayed response. My puppy had surgery and things are just a tad crazy! Yes you most certainly can. Just a couple tablespoons of cornstarch mixed with a couple tablespoons of cold water should do the trick. This soup is so creamy and delicious!